A Brief History of C.L.G. Beal Atha Na Muice. There is evidence that the parish of Swinford boasted three football teams in the 1880’s. This was shortly after the founding of the GAA in 1884 in Hayes Hotel in Thurles. Around this time, 1880/1890, among the teams locally were sides named “The Commercials” and “The Sextons”- called after a member of Charles Stuart Parnells parliament. Later a new club was founded in the town called “The Young Irelands”. Around 1909/1910 Swinford fielded a strong junior team which won the county title. The captain of this team, Michael McNulty was sadly killed in action in the 1914-18 war whilst serving as a captain in the British Army – where many young Irish men served. At the beginning of the 1900’s football was played in Newpark but later moved to the present location in Brabazon Park, and from that time the game has flourished in Swinford, right up to the present, with our senior side playing in the top flight of Mayo Club football. 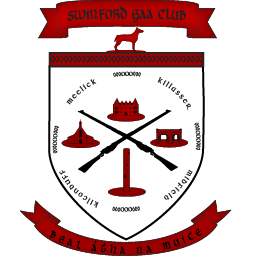 Back in the 20’s hurling was popular locally, but alas the Caman is no longer wielded in Swinford – we won a county Hurling title in 1919 and among the winning fifteen were Jimmy Groarke and James Quigley (Bridget St) and Michael Lambe, Main Street. Also in the 20’s the town had a team known as ‘The Diggers’ who wore green jerseys with a white stripe. In the 30’s Billy Durkan and Fr John McNicholas featured on the Mayo minor team which won its first all Ireland title, in 1935. Billy has the unique distinction of being the holder of All Ireland Medals in Minor, Junior and Senior grade and also in Handball – truly an outstanding sportsman. In the 1930’s, a feature of the local football scene was the 1934 Parish League for the Kilroy Medals – presented by the local garda superintendent and featured sides from Ballinvoher, Ballydrum, Cloonlara, Derryronane, Killasser A and B, Killaturley, Kinaffe, Meelick and Midfield – won by Killasser B team. Football fell into decline in the 1940’s – due mainly to World War II when socially and economically times were lean. But in 1949 our Junior football side reached the Mayo Final, where they had to bow to Mulranney by a narrow margin. Two years later –1951– a County title came our way when the Minor team, which included the late Harry Brennan, did the honours. In 2001 the Club was proud to host a function in the Gateway Hotel, to honour the 50th anniversary of that title winning performance.